Riga to Hong Kong – an Ayres Adventures Epic Journey! 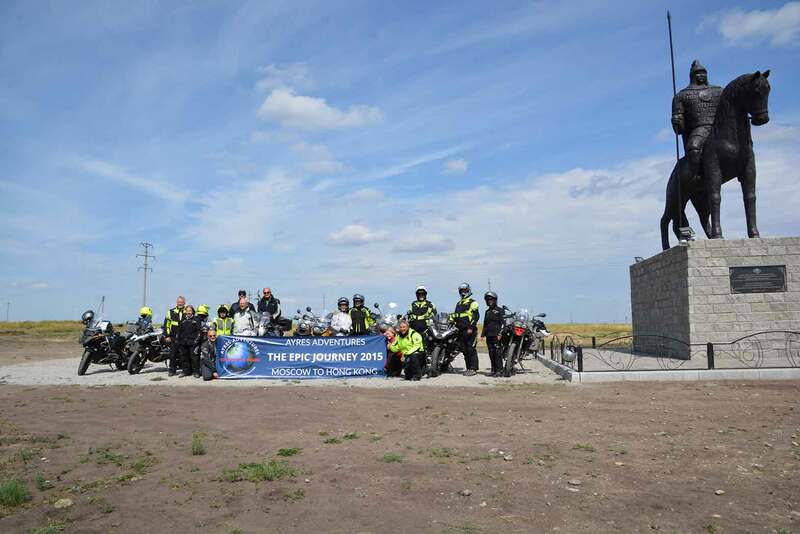 This fully-supported expedition through Russia, Kazakhstan, Mongolia and China begins in Riga, Latvia and ends in Hong Kong – nearly 12,000 miles and 69 days later. In 2017, we are making it possible for riders who do not have the time for the full Epic Journey, to select either the first or second part of the adventure. The first part will start in Riga and end in Beijing 36 days later. The second part consists of 34 days, beginning in Beijing and ending in Hong Kong. We have a special email distribution list for those who are seriously interested in this Adventure. Send an email to The Epic Journey if you would like to be included. A tour of Riga, the capital of Latvia and one of the former Soviet Baltic States. A ride along the coast of the Baltic Sea (Gulf of Riga) to the medieval city of Tallinn, Estonia, with a special “Medieval Night” of entertainment in Tallinn. Two nights in St. Petersburg, including a tour of the city and nearby attractions including Peterhof, The Hermitage and the Palace of Catherine the Great. Several nights in Russia’s “Golden Ring” cities – ancient towns (often referred to as “open air museums”) which preserve the memory of many of the most important and significant events in Russian history. An introduction to Moscow, including a tour of the city, including Red Square and the Kremlin. A free day in the multi-ethnic city of Kazan – the “Third Capital of Russia”. Several days in Kazakhstan, with visits to many of the country’s most interesting attractions. Several days in Eastern Siberia, including two nights at Lake Baikal and a night in the nearby Tunka Valley. A ride through Mongolia on our way to the Chinese border. Four weeks in China, where we’ll visit many of the most popular and interesting attractions China has to offer. 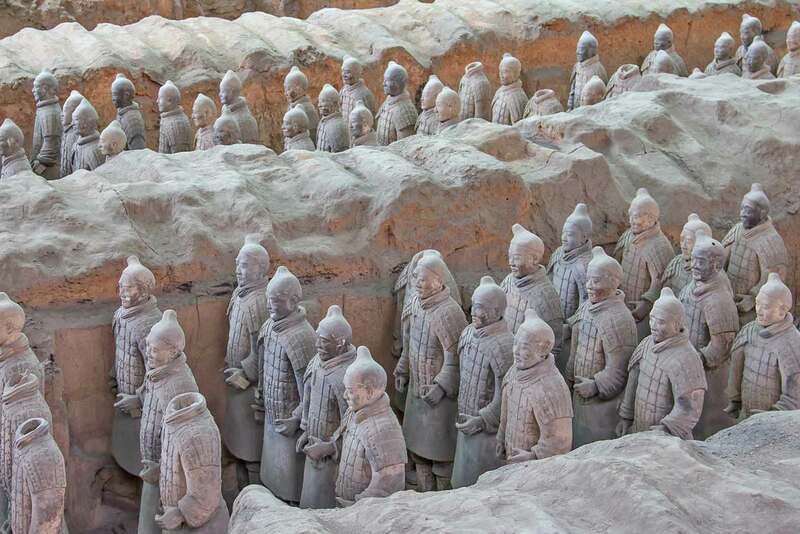 We will visit the Great Wall, ride The Silk Road, and stop in Xi’an to see the incredible terra-cotta army. With a two-night stay to enjoy Hong Kong’s attractions, we’ll include a tour of the city and a ride on Hong Kong’s Peak Tram – Asia’s first funicular railway that rises steeply above skyscrapers to the top of Victoria Peak. Welcome to Riga, Latvia. As the official arrival day for the tour, the tour leaders will arrange your transfer from the airport to our first tour hotel in Riga. Today you will have the chance to enjoy Riga which has been named a UNESCO World Heritage Site thanks to the collection of art nouveau buildings that is one of the largest in the world. Tonight we will have our tour briefing and kick off dinner at a very nice local restaurant. Our first riding day of the tour. We leave Latvia and head into Tallin, capital of Estonia. Relaxed and easy riding through forests, small local towns and villages. Tallinn’s medieval Old Town is known around the world for its well-preserved completeness and authentic Hanseatic architecture. Enchanting atmosphere, rich cultural scene, beautiful surroundings. From Tallin we will head straight to Russia border. We will cross border at city Narva. The Hermann Fortress, which looks across the Narva River to the Russian castle on the other side, is the best-preserved castle in Estonia. Narva is the only location in Estonia that offers an unobstructed view of Estonia’s neighbour Russia. Built from nothing by westward-looking Peter the Great, St Petersburg was from its inception to be a display of imperial Russia’s growing status in the world. Fine-tuned by Peter’s successors, who employed a host of European architects to add fabulous palaces and cathedrals to the city’s layout. Today we have opportunity to visit Peterhof, Peter the Great summer palace. We leave the beautiful city and head to the quaint Russian province. We’ll stay near the historic city of Tikhvin. 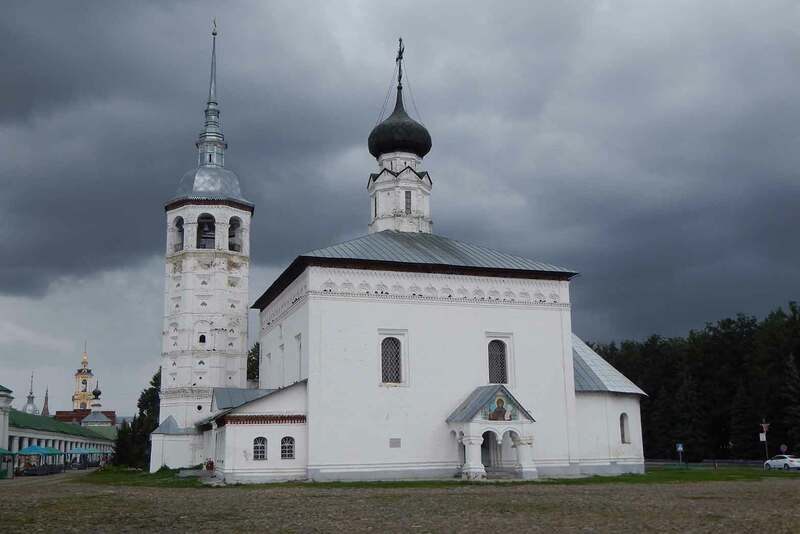 In the XV century it has become an important religious and cultural centre of North-West Russia as it was the shrine of the miracle-making Tikhvin icon of the Mother of God. The old medieval town with its ancient monastery and wooden houses will give you a good insight of a typical Russian provincial city. We will ride along Rybinsk reservoir, also known as the Rybinsk Sea. In 1941 a large dam and a hydroelectric station were completed on the Volga immediately above Rybinsk. Some 150,000 people had to be resettled elsewhere, and the historic town of Mologa in Yaroslavl Oblast along with 663 villages have completely disappeared under water. On our way to the capital of Russia we’ll make a stop at Sergiev Posad, founded in the 14th century by the Saint Sergy Radonezhsky. The most important sight of the town is the Trinity Lavra of St. Sergius, which is enlisted in the UNESCO’s World Heritage List. It’s a very nice stop for coffee and break. Riding along wide highways we’ll get straight to the heart of Moscow and stay close to the red-brick Kremlin. Your hotel is within walking distance from the Red Square, the Kremlin, the Bolshoy Theater and many other places of interest. It’s just a few minutes away from the shopping area with numerous fashionable shops and restaurants. This day is at your disposal. It can be really fascinating time for you as Moscow offers plenty of options for things to do. It is a good easy day out of Moscow and we should get to Suzdal early in the afternoon so that you can enjoy walking around the small city centre. Suzdal is one of the Golden Ring Cities and one of Russia’s oldest settlements dates back to the 11th century and is located on the Kamenka river which runs along the front of tonight’s hotel. Riding through a variety of scenery today will bring us to what has to be one of the most stunning cities in Russia, Nizhny Novogorod with a beautiful pedestrian street running through the city where you can enjoy local artists and street buskers performig their arts as well as enjoy great views of the historical buildings and kremlin found along Bolshaya Pokrovskaya walking street. After covering several miles through Russia we get to the city of Kazan, the perfect place for a two night stop with the hotel perfectly located on the pedestrian only Bauman Street that runs through the city. A free day in Kazan will give you enough free time to enjoy walking around Kazan and enjoying this lovely city and the historical buildings, cathedral and museums. A stroll at night will give you a completely different perspective of the city as the buidlings are lit up and look stunning at night. A good days riding through more remote parts of Russia with great scenery of the surrounding famrlands. We will also cross through time zones on todays ride. This great day is ended in a nice hotel with a wonderful dinner at a really nice local restuarnat. Today we get to ride through the Ural Mountains that form a natural boundary between Europe and Asia as we head to Magnitogorsk. We will get to see some really beautiful and very old Siberian villages and traditional life in Siberia. Another time zone and another country! Welcome to Kazakhstan where we will spend the next few riding and enjoying this small country. To top off a great day of riding through rural Kazakhstan, we get to spend two nights in an absolutely spectacular hotel on the shores of Lake Shuchie. Relax and enjoy the hotels many amenities, play some tennis, swim, go to the gym or the spa. Those are only a few of the many options that you will have on this free day. Of course there is a great loop ride around the lakes for those that would like to do some more riding. To enjoy and get a full taste of Astana we will arrive after a short day on the bike and partake in a city tour that will explain the modern and futuristic buildings scattered around the city centre. A long day is only complete after a good local meal which we will enjoy in the city of Astana. A great ride through some very remote parts of Kazakhstan to the city of Pavlodar which was only opened up to tourists in 1992. Today we wave good bye to Kazakhstan as we head back into Russia and through another time zone. Passing through Slavgorod we get a taste of a typical city built during soviet times that does not seem have changed ever since. You really know you are in Siberia as you head through the open plains and remote parts of Russia. With lovely scenery, local food markets and the Novosibrisk Reservoir, there is a lot to see along todays ride. Tomsk is located on the Tom river and established in 1604, thus making it one of the oldest towns in Siberia. A great little city for us to walk around after a good days riding to get there only to finish the day with a great dinner at a local restaurant. Todays riding through more remote parts of Siberia will take us to the city of Krasnoyarsk on the banks of the Yenisei River. 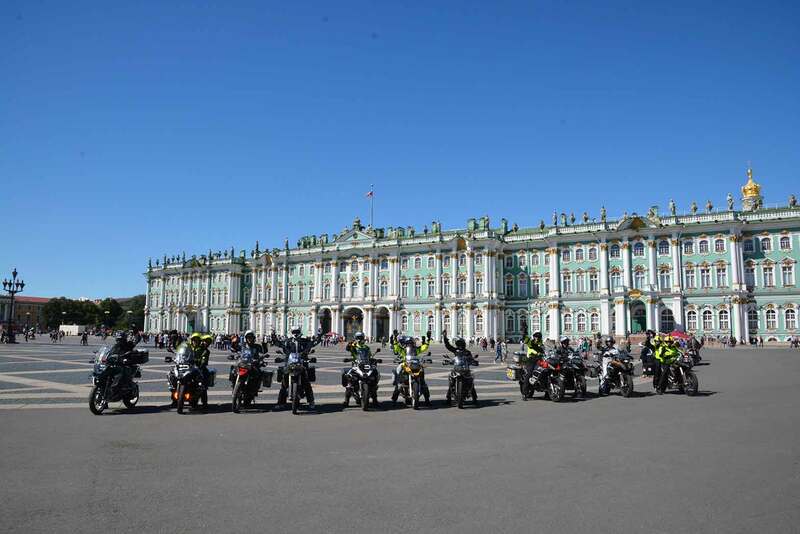 The free day in Krasnoyarsk gives us time to have the bikes serviced as well as for you to kick back and relax or to enjoy the day exploring Krasnoyarsk via a boat cruise on the Yenisei River. This is Siberia! Surrounded by beautiful forrest, endless open plains and beautiful views of small traditional Siberian villages whilst riding along on beautiful roads, a stunning days riding. There are many interesting facts about Lake Baikal, it is the largest (Volume) freshwater lake in the world with about 20% of worlds fresh (Unfrozen) water. It is the deepest (5387ft), one of the clearest, thought to be one of the worlds oldest lakes and is home to approximately 1700 species of plants and animals, two thirds of which can only be found here. The perfect place to spend two nights to explore and enjoy. A free day to enjoy the wonders of Lake Baikal. Wither you chose to enjoy the stunning views from the hotel that overlooks the lake or a boat cruise on Lake Baikal, today we will enjoy the wonders of this breathtaking UNESCO World Heritage site. Yet another breaktaking ride as we continue our way through Siberia and enjoy stunning views of small local Siberian villages as we ride towards Arshan located deep in the Tunka valley. Arshan to Ulan Ude is a day filled with lots of beautiful sites. We will ride along the shore of Lake Baikal where we can stop and take pictures of the bikes ride on the lake, or of the 400 year old monastery hidden away from the road overlooking Lake Baikal. Today we say good bye to Russia as we cross the border into Mongolia. A small, sparsely populated country that offers breathtaking views of rolling hills, nomadic life of those living in Gers as the herdmans cattle roam around while grazing on the rolling hills. Welcome to Mongolia! Passing through the capital city of Mongoli, UlaanBator, we head to a breathtaking hotel quietly hidden in the rolling hills of Mongolia. Away from the hustle and bustle of the city traffic, this gem of a 5 star hotel is the perfect place to enjoy time, kick back and relax in perfect comfort. A free day in Terejl is a lifelong memory. The hotel is out of this world, the scenery beautiful and peaceful, this is the perfect place to simply relax and enjoy where you are, deep in the heart of Mongolia. Of course, its also a great place to discover and learn more about the three main sports of Mongolia, archery, horse riding and wrestling. 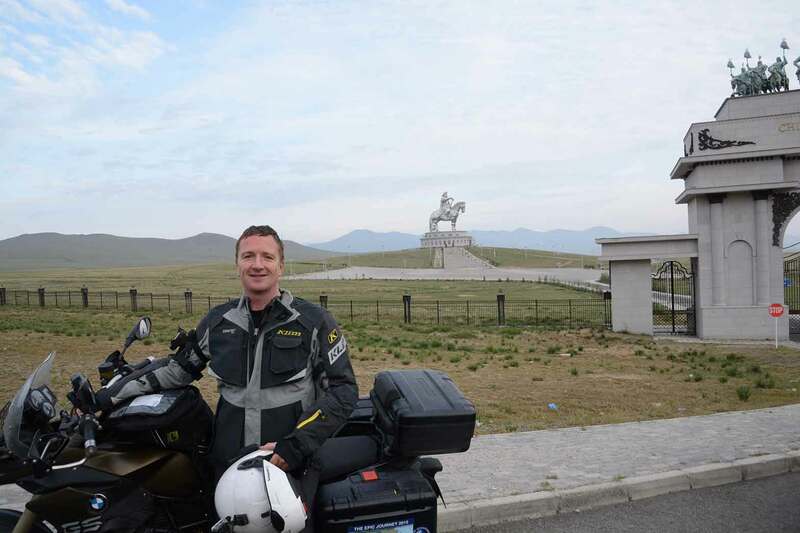 Enjoy a photo opportunity of the 131 feet high Genghis Khan statue before we head south through the Gobi Desert! Staying in a Ger tonight is a great fun experience that offers breathtaking views of the sunset and sunrise over the desert. Good bye Mongolia, hello China! 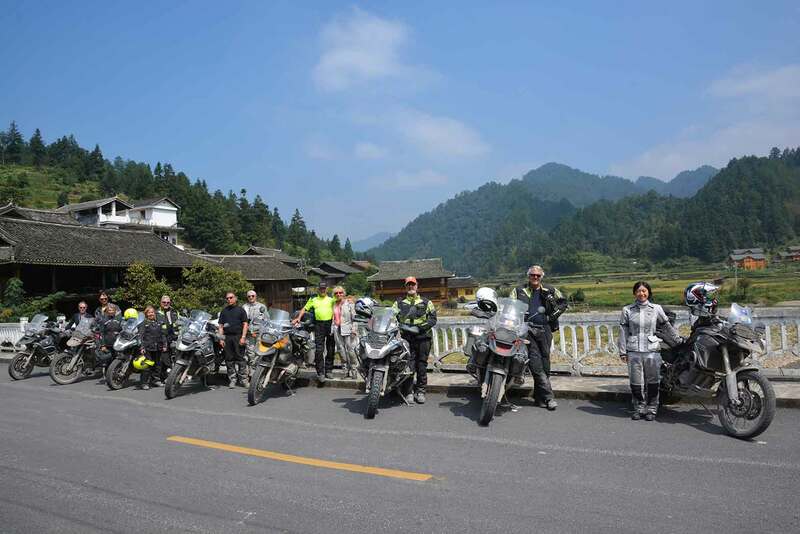 Todays ride takes us across the border into the amazing and diverse Peoples Republic of China. Its like stepping into a different world as soon as we corss the border. A world of diverse culture, people and dining, China is an incredible adventure and we have a month to enjoy this incredible part of the world. 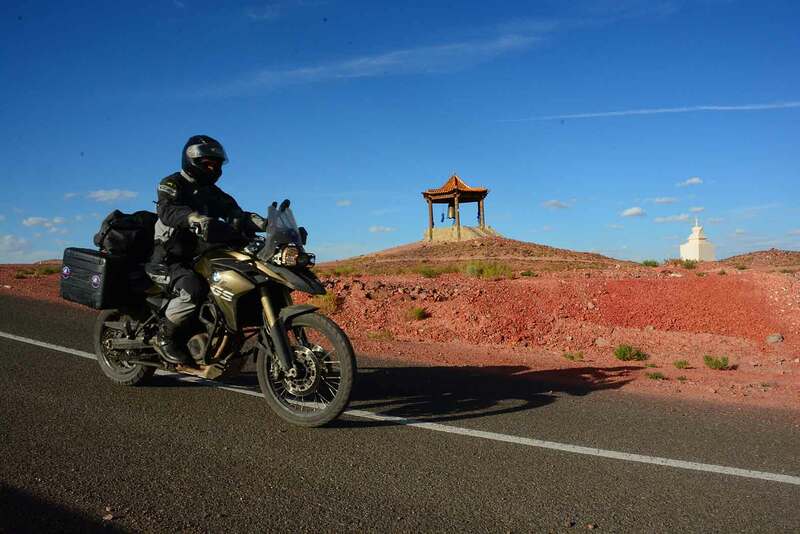 Our first riding day in China takes us through the southern Gobi Desert as we head south into China. Riding your own bike in China is a real privilege due to the limitations of foreing vehicles allowed in China. It’s a great feeling to be one of the few to be able to enjoy this amazing adventure on your own machine. 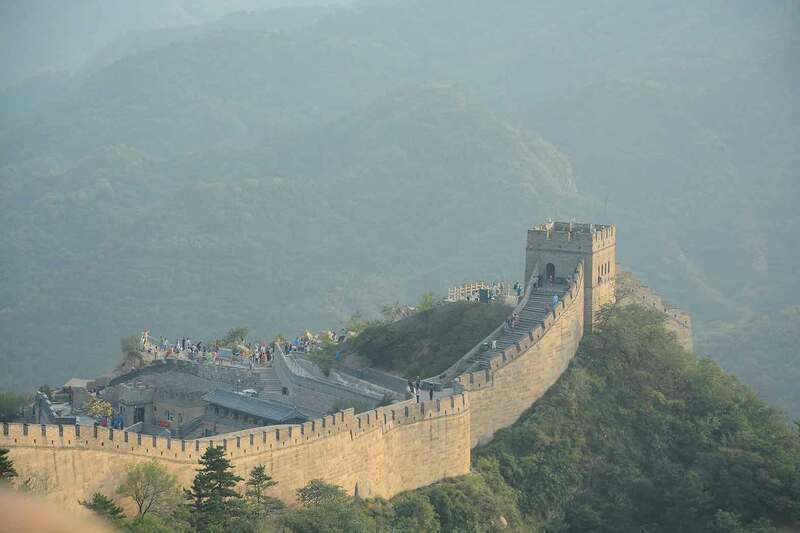 The Great Wall of China is one of the many amazing things you will see on todays ride. We will stop for a chance to walk along the top of this incredible historical site. Beijiing, the capital city is our destination for the next two nights. Day 37: A free day in Beijing. A free day in Beijing is the perfect chance for you to explore the Forbidden City right in the heart of Beijing. There is also the Olympic Park as well as many other incredible sights to see within this incredible city. A carefully planned route will have us out of Beijing without taking too long and have us heading south to Zingtai where we will enjoy the luxuries of a new 5 star hotel. Today will be one of the many highlight rides that we will enjoy in China. The Guoliang Tunnel is probably one of the most famous roads in China. A hand carved tunnel in the Taihang mountains that offers absolutely incredible views and photo opportuniites. Another day of absoltluey breathtaking riding and views. 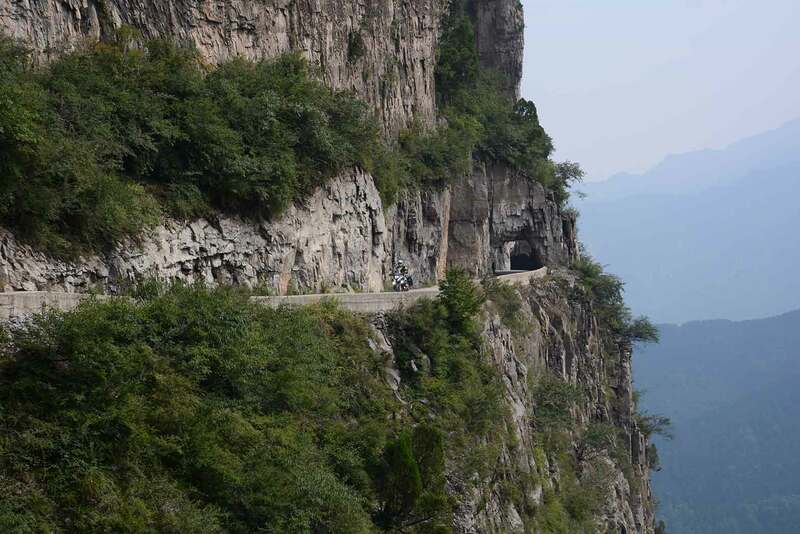 Whilst the Guoliang Tunnel may be the most famous of the hand dug tunnels in China, we will get to explore several other tunnel roads today that are longer, higher and absollutley spectacular. Be prepared for one of the most incredible rides that you have ever done! 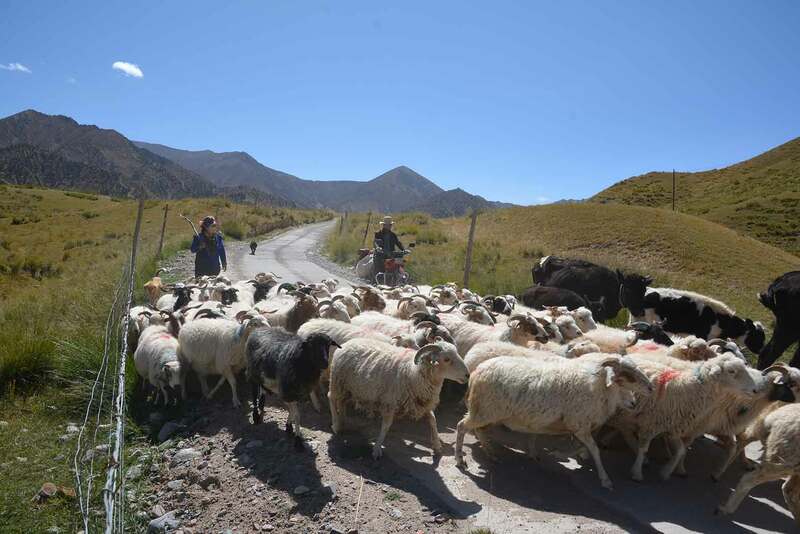 An interesting days ride as we ride through many small towns on our way to Huayian. Huayian is home of the Huashan Mountian which is one of China’s Five Great Mountains, Huashan has a variety of temples and other religious structures on its slopes and peaks. The Terra Cotta warriors museum is on the way to Xian. Being a slightly shorter riding day we will have lots of time to enjoy this incredible museum. Artifacts in the museum date back to 210 – 209 BCE but this incredible discovery was made by local farmers drilling for water in 1974. Xian is a walled city which can easily be explored by foot or by bicycle. The hotel is so well located that exploring the wall would be a great thing to enjoy on this rest day. Xian is one of the oldest ciities in China and is also the starting point for the Great Silk Road. 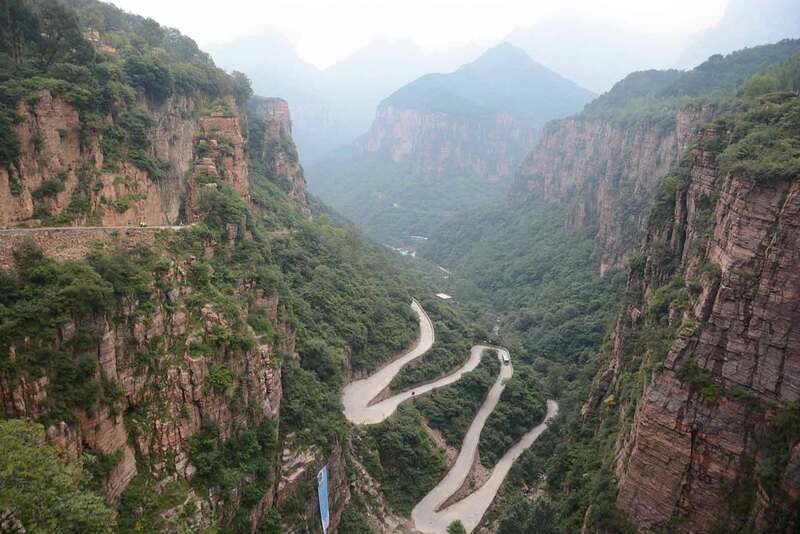 Once we are away from the hustle and bustle of Xian we will take a detour off the provincial road that offers amazing views of the terraced mountain sides. These terraces are dug by local farmers on which they grow maize, rice and other vegetables. We will also see a lot of traditional house caves or ‘Yaodongs’ dug into the mountain sides. Of course, a great ride like this can only finish in a beautiful 5 star hotel. Heading north from Pingliang we will spend the day riding high up in the mountains that once again offer incredible views of the terraced hills sides and ‘Yaodongs’. 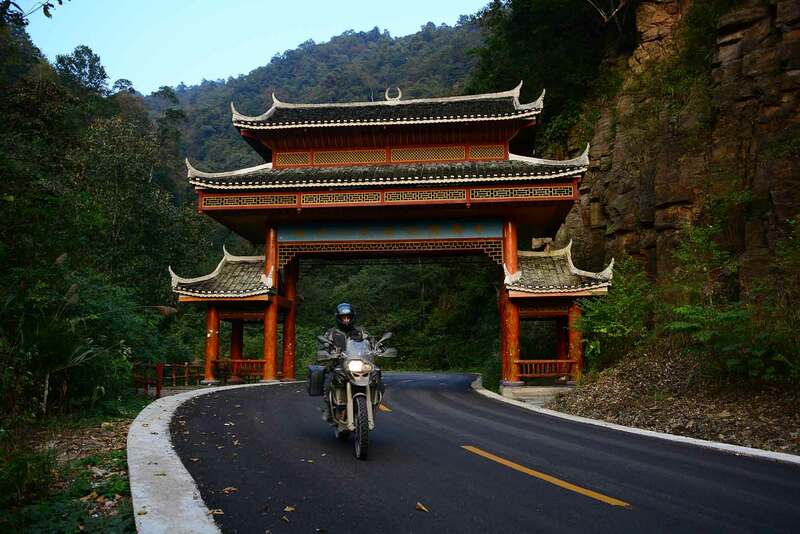 Another incredible ride through more remote parts of China. Lanzhou will be the last really big city that we will have to go through for a while. Once out of the city we start riding through more remote parts of China on smaller narrow roads with a lot less traffic. Tonight we will stay in a more tradiotional, comfortable local hotel. The silk road starts in Xian and we will have been riding on it for a few days, but today you really do get the feeling that you are riding on the original part of the Silk Road. Being out in the desert with snow capped mountains as a back drop makes for some beautiful scenic riding. Another great days riding as we follow the small narrow road through the desert. On the route we will follow several miles of a very old and original looking section of the Great Wall. There are several opportunities along todays ride where we can stop and take pictures of you and the bikes parked right next to the Great Wall. A free day in a beautiful hotel in Duanhuang is the perfect place to take off and enjoy the Magao caves. ‘Caves of The Thousand Buddahs’ date back to 366 CE and form a system of 492 temples. Or you could explore the surrounding sand dunes by foot or from the back of a camel. Another absolutely incredible days riding with incredible views. Todays ride is a motorcyclists dream as we enjoy really twisty, quiet, open roads as we make our way up to 3600m/12 000ft. 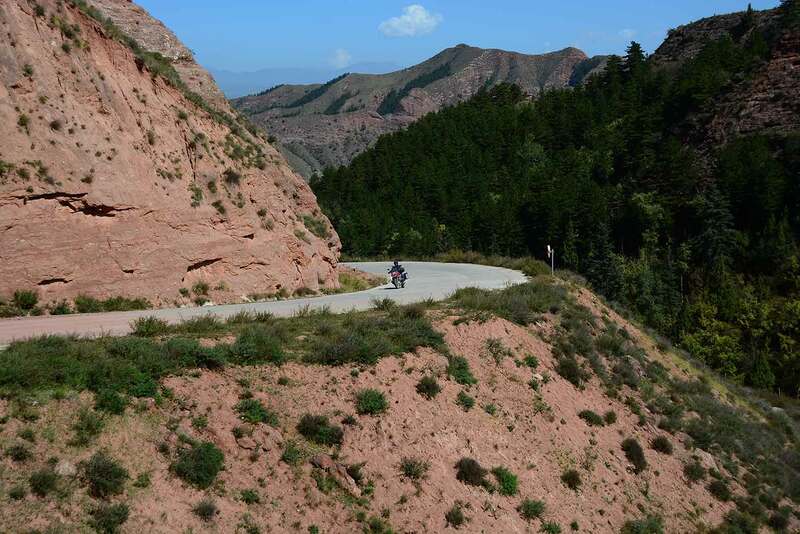 We will ride the edge of Tibetan Plateau also known in China as the Qinghai-Tibet Plateau or Himalayan Plateau. As you can only imagine, the views on todays ride are absolutely out of this world as we are surrounded by the incredible mountain ranges. Beautiful, quiet twisty roads, Tibetan Monastaries, Qinghai Lake all surrounded by snow capped mountains, how can this not be a picture perfect ride? The first part of todays ride will remind you of Arizona with the red rock cliff faces. Crossing the Yellow River we enter Kanbula National Park, with views and riding that are out of this world. Todays ride makes it hard to believe that you are in China, or that you never imagined China to be asbeautiful as today. Riding through remote parts of China offers some great photo opportunities and today is another one of these days. 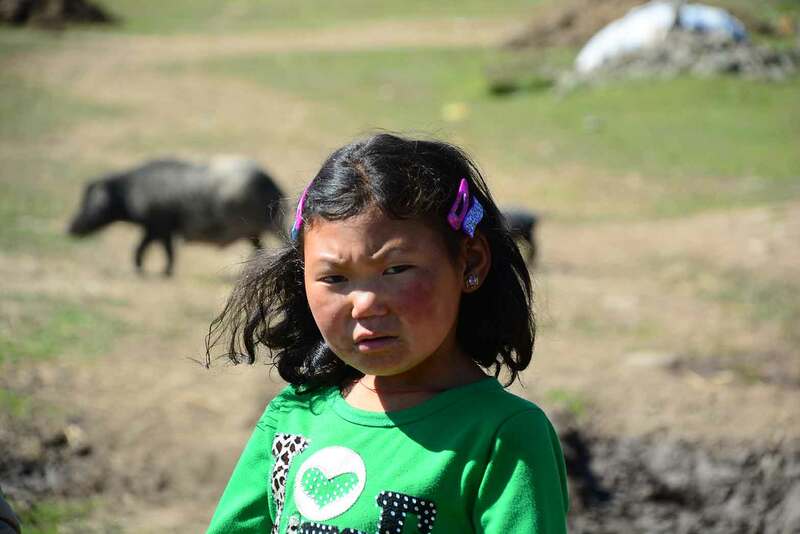 As we pass through small local villages you will see local Chinese farmers busy with their crops and cattle as the children play in front of their homes. A great day to photograph rural life in China. 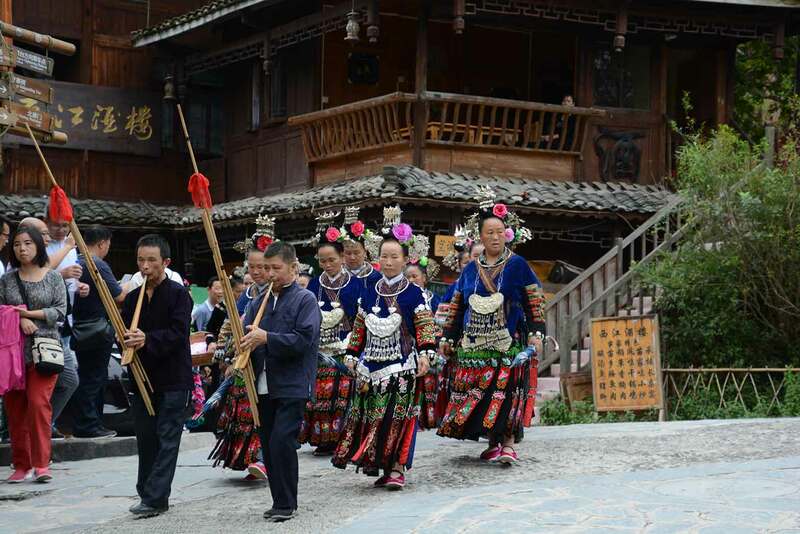 Spend the entire day weaving your way through some incredible valleys, lunch at a small local restaurant and finish the day at a very luxurios hotel in the city of Chengu. Chengdu is a great city to walk around and explore. Enjoy walking along the banks of the river right in front of the hotel, take a stroll down the pedestrian only side streets and enjoy dining at one of the many small local restuarants. Chengdu is home to The Giant Panda Breeding Research Base where you are able to hold one of these almost extinct creatures. Another carefully planned route will have us out of the city quickly to avoid the inner city traffic. Southern China is beautiful and vastly different from what we saw and enjoyed in Northern China. Be prepared for more incredibly beautiful scenery and riding. An interesting days riding as we pass through several small villages on our way to a wonderful boutique hotel in Renhuai. We will also pass through Maotai Town, where you will see several small distilleries that produce baijiu a local Chinese alcohol that can be found everywhere. Great views of surrounding hills, twisty roads and several small villages are some of the things that we will enjoy on our ride to Fuquan. You may also see farmers pulling rice from their rice fields, most of this is still done by hand in the rural villages and makes for some great photo opportunities. A short riding day will get us to the hotel early so that you can enjoy walking around this 1000 year old village. While there are a lot of tourist shops, it’s a really interesting place to walk around. The hotel that we will be staying at is a small, privately owned boutique hotel right on the river front. 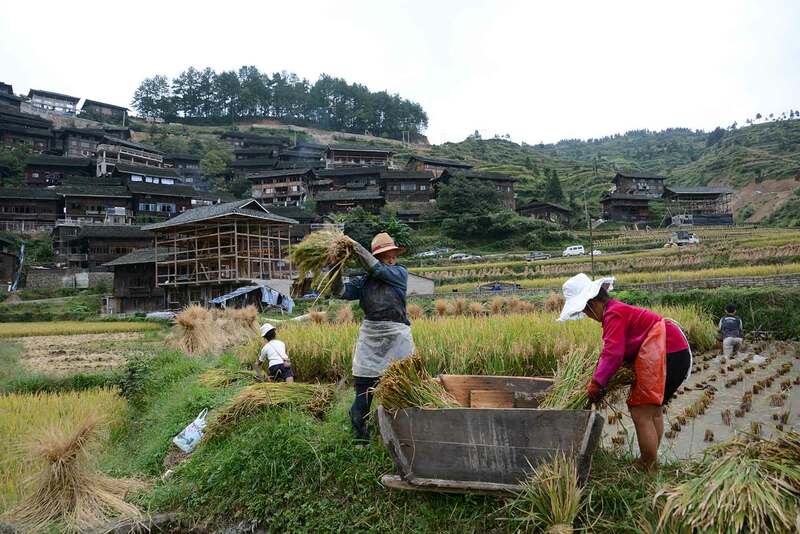 Be prepared for yet another great days riding as we ride up in the mountains with lots of farmland, terraced rice fields, really pretty and lots of photo opportunities of traditional villages and way of life. This is rural China as one would imagine it to be! Tonights hotel is a small privately owned home, built in Chinses tradional style, that the owner has made into a small hotel. Dong Village is a small traditional working village tucked away in the mountains that offers some great photo opportunities of traditional Chinses buildings and bridges. The stunning resort that we will be staying at for this two night stop has everything to offer. 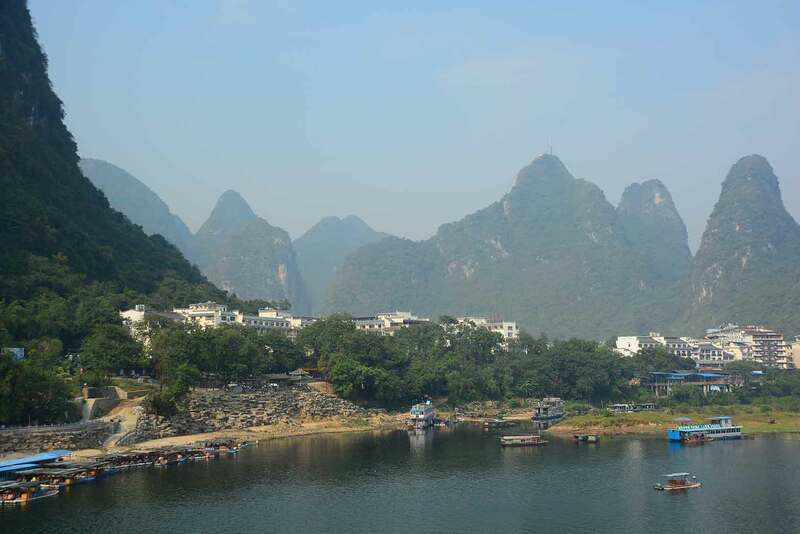 Its modern, new and with so many amenities as well as being on the banks of the Yulong River its an easy place to simply spend the day enjoying. The last riding day of this incredible journey. We have carefully chosen the route to Shenzhen to avoid to much traffic. Tonights hotel is absolutuley spectacular, right on the ocean with incredible views. Before stopping at the hotel we will take a short detour for a great group photo with Hong Kong and the ocean as our back drop. Today we pack up the bikes for shipping before heading to Hong Kong. During the free day in Hong Kong we will enjoy a wonderful city tour before enjoying a great final dinner at a great local restaurant in Hong Kong. The last day of this incredible adventure has arrived. We will arrange your transfers to the airport. You have just finished the adventure of a lifetime and take with you lifelong memories and photographs to share with family and friends that will remind you of this amazing journey. In addition to the tour cost (see below) each rider is required to provide their own motorcycle and is responsible for the cost of shipment to Riga and from Hong Kong. Ayres Adventures will assist in making shipping arrangements, but all costs associated with shipping are the responsibility of the rider. 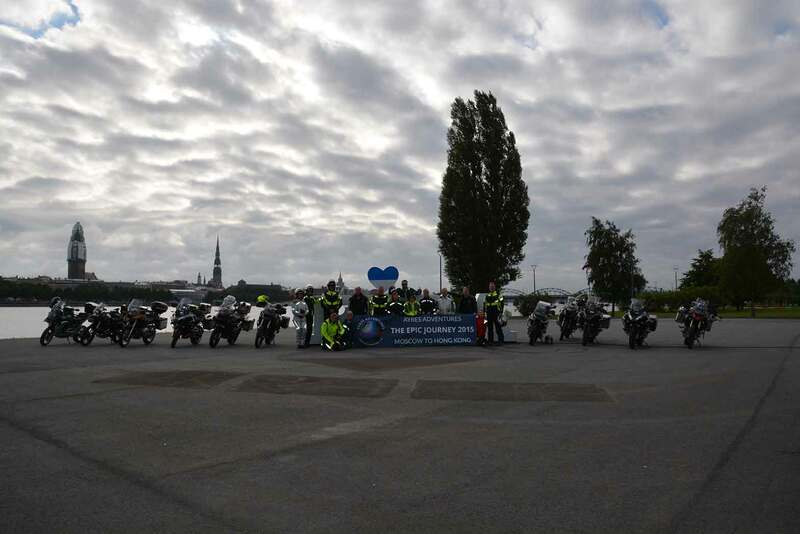 We are also working on the option to assist riders with the purchase of a new BMW motorcycle in Riga, with shipment back to Latvia or Germany so that the bike can be resold after the Adventure. Accommodations and meals will generally be the best available. This will vary from the equivalent of 4 and 5-star lodges and hotels in major cities, to more basic accommodations in remote areas. In some cases we will enhance the authenticity of the experience by spending a night or two in lodging that is typical of the areas in which we’re traveling, such as gers in Mongolia. Ayres Adventures will provide sufficient experienced staff and support vehicles needed to operate this Adventure as a premium-level travel experience. Support vehicles will be used to carry rider luggage; only personal items (cameras, water, snacks, rain gear, etc.) must be carried on the motorcycle. The number of staff and support vehicles used will depend on the number of riders who book the trip. 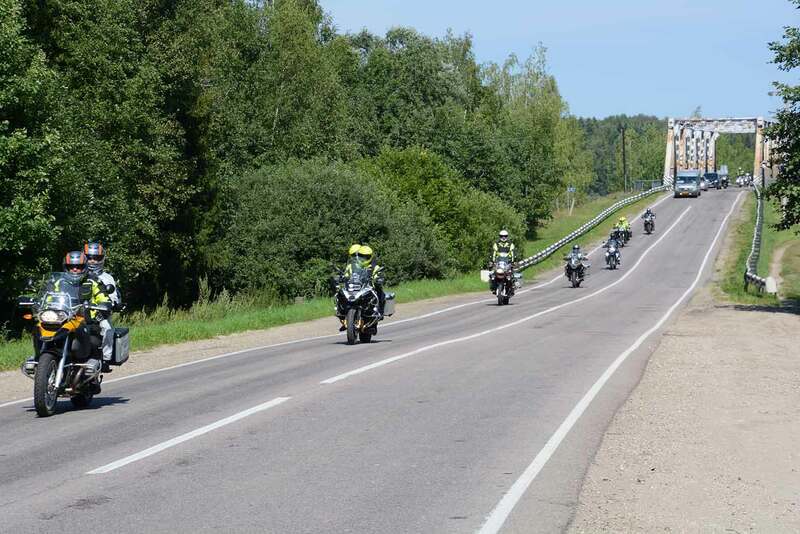 The leadership team will include at least one support vehicle driver and two tour leaders riding motorcycles, including a paramedic on a motorcycle. 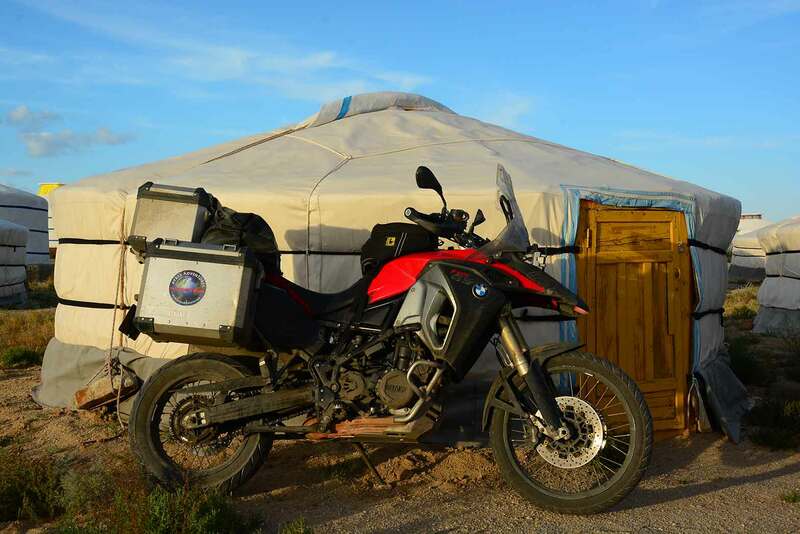 The licensed paramedic is authorized to dispense more than 100 different medications, and is also an experienced BMW motorcycle off-road training instructor. The scouting and pre-ride of the complete route has now been finished. The leadership team has been identified. In addition to our own staff, we will also use local guides with intimate knowledge of attractions that we visit during the trip. In addition, Svetlana Malygina, who has operated her own travel agency in Moscow for more than ten years, will have responsibility for hosting the tour through Russia and Kazakhstan. Sveta grew up in a small village on the Mongolian border, has lived and attended university in the far east (Vladivostok) and has family located throughout Russia. She will insure that riders enjoy an authentic, in-depth cultural experience in these countries – an experience not available to most travelers. 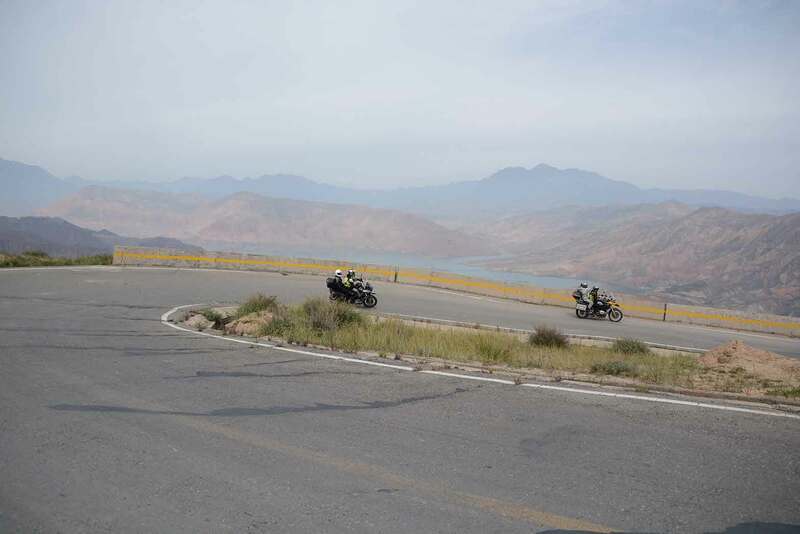 Legal requirements in China call for an approved local company to accompany foreign motorcyclists. We have arranged for the leading company in providing logistical and guiding services in China to meet this requirement. After deposits have been accepted, registrants will be invited to subscribe to a special page to communicate with each other prior to the tour. During the trip, we will use SPOT tracking devices to map our progress, and we will maintain a LiveJournal with weekly updates. Subscribers to our email list will be notified as additional material is posted. Bookings and deposits are being accepted now and may be made over our website. Unless you have traveled with us before, we may arrange a telephone interview to insure that candidates have sufficient experience and are otherwise qualified to undertake this Adventure. The deposit is non-refundable. We suggest that you procure trip cancellation/interruption protection before you place a deposit. Most travel insurance companies will not sell trip cancellation and interruption insurance after payment has been made. If you cancel after the final payment amount has been paid, you will receive a 50% refund if the cancellation is made more than 60 days before the scheduled start of the trip. If you cancel less than 60 days before the scheduled start of the trip, no refund will be made. All accommodations on a double occupancy basis. Participants may request a private room by paying a single room supplement. Lodging will vary from very basic “best available” to 4-5-star facilities, with an emphasis on premium-level accommodations wherever available. Airport transfers. Our local support staff will meet your arrival flight in Riga and will accompany you to the hotel. In Hong Kong, we will provide the airport transfer to the departure airport. All breakfasts, most dinners, and some lunches. Dinners will be included except for some two-night stops in the same location, in which case participants will be responsible for their own dinners. Special events and cookouts for lunch will occasionally be provided. Support vehicle(s) for transporting luggage (two reasonably-sized pieces of luggage per participant). A team of tour leaders, both on motorcycles and driving the support vehicle(s). A licensed paramedic equipped with appropriate medical supplies to deal with anticipated emergencies. All park entry fees, event fees, and ferries along the designated itinerary. This includes numerous off-bike activities and use of local guides as needed. Bonds required to secure permits for vehicles to enter China. These bond amounts vary depending on the age and value of the motorcycle. For late-model BMW motorcycles the bond amount is as much as 75% of the value of the vehicle. Fees for securing Chinese license tags, insurance, permits and temporary Chinese drivers licenses. 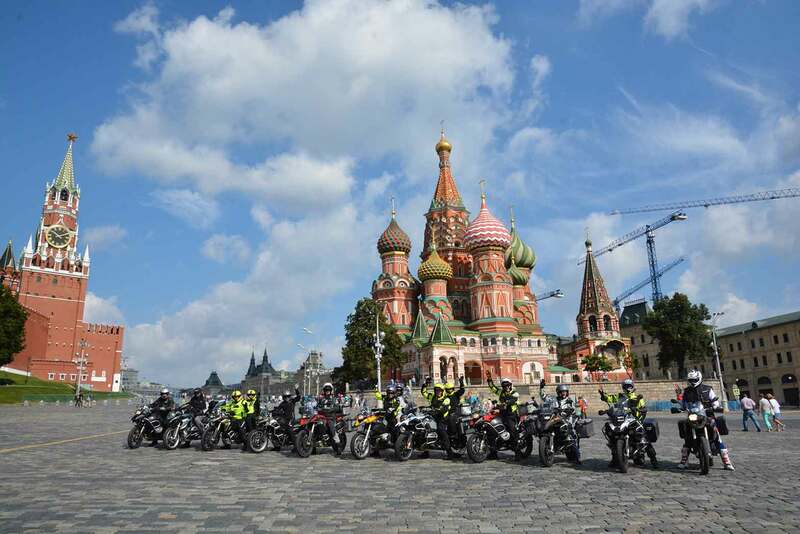 Assistance with arrangements for shipping motorcycles to Moscow and from China. GPS routes and waypoints suitable for use with a Garmin GPS receiver. The Plan Ahead – a trip booklet providing detailed daily ride information and other information about the trip. This booklet will also include advice on the setup of the motorcycle and other tips for trip planning. The booklet will be available to those who have booked the trip by the first quarter of 2014. A scheduled stop midway through the trip to allow for motorcycle service and tire changes. We will insure that sufficient new tires are available for the motorcycles, but the cost of tires and service is not included. Personal motorcycle. Each rider is responsible for providing a “GS-style” motorcycle suitable for highway travel as well as off-road travel. Ayres Adventures reserves the right to approve the model of motorcycle that will be used, and recommends the BMW GS line of motorcycles. Travel and medical evacuation insurance. Registrants are required to secure medical evacuation insurance. We will recommend appropriate insurance, but the cost is not included in the price of the tour. Tips for local tour guides and drivers. If you feel that you have received outstanding service, you may express your gratitude with an optional tip. Our staff will offer guidelines on what is appropriate. Visa application fees. Where needed, we will provide letters of introduction and support documents. Airfare or other transportation costs to Moscow or from Hong Kong. Motorcycle shipping cost and all licensing and insurance costs. Lunches, except for those included as part of a featured activity. Entrance fees for museums and other attractions not specifically identified in The Plan Ahead as an included item. Bike servicing, repairs, tire changes, and other motorcycle expenses.